I woke up today and didn’t want to write. I wanted to do anything but write. I felt, What’s the use, it’s never been a happen, I’m never going to be able to earn a significant portion of my living from my writing. But I know with that sort of attitude only one thing is guaranteed: I’m guaranteed to fail. So I wrote this blog post with myself in mind. 1. You owe it to yourself. If earning your living from writing is your dream, the only way your dream is going to come true is if you keep at it. There’s only one person who can make your dream come true: You. Remember, if this were easy then everyone would be doing it. There’s a reason they’re not. 2. If you try you will succeed. I’m not saying that if you try you’ll get rich, or that you try you will be able to earn enough money from your writing to quit your day job – that would be nice, though! What will happen is that you won’t have given up on your dream and, yes this sounds corny, but that’s success. You’ll be a writer. There’s a reason why the phrase, ‘starving writer,’ trips off the tongue so easily. They say that at the end of life as you look back at what you’ve done, what you’ve accomplished, you don’t regret the things you did, you regret the things you didn’t do. I don’t know if that’s true, but it sounds right to me. You’ve heard this one before. Personally, I think it’s like a series of triathlons! When I picked up the software last week, I thought that this might be a way of getting another half hour per day to write. It takes me 15 minutes to walk to work, but if I could use a digital recorder to dictate parts of my story, perhaps even a blog post, I could squeeze another 30 from the day. I haven’t tried that yet, but something unexpected has happened. This new way of writing – perhaps I can’t, or shouldn’t, call this writing; perhaps I should call it speaking – has made the words come easier, has reinvigorated me. One thing Dragon NaturallySpeaking had been excellent for is transcribing my longhand notes. Often when I get an idea for a story I write it out longhand and these notes can run to hundreds of pages! Over the past few days I have been faced with the task of typing in about 50 or 60 pages of notes, something that takes me a long time to do. Last night, using Dragon, I transcribed the lion share of my notes in about half an hour! Perhaps it’s the novelty that made it seem effortless – and fun! – But it seemed to go much faster, and I’m a fast typist. I love books, especially journals. New journals. Over my lifetime I’ve filled bookcases with journals covered in my scribbling. (And, no, I’m not a serial killer!) For me, if I need special motivation, I tell myself, “Self, all you need to do is fill up this journal and you can buy yourself a new one.” And, believe it or not this often works. Okay, I’ve spent a couple of hours doing things like answering emails and reading posts and now I have half an hour to compose a blog post. Can I do it? Yes I can! By talking about three things that seemingly have nothing to do with one another. It was my birthday last week and thank you to everyone who said happy birthday, I really appreciate it! I worked on my birthday — I’m talking about my day job — so my friends are taking me out today to celebrate. I’m going to Society. That’s later, in a few minutes I’m heading off to a NaNoWriMo luncheon and information session. I’m excited! As I’ve said too many times, this is my first year doing NaNo and the ‘bright shiny’ hasn’t worn off. I talk to other, veteran, NaNoers and they look at me pityingly with memories of bleary, bloodshot eyes and waking up at their desk, gripping a half-empty can of Red Bull. I’m time-starved, so I know something is going to have to give. Sleep, of course. Showering … hmmm, probably try to keep that one. One thing that’s probably going to fall by the wayside is Dragonvale, a delightfully addictive game featuring … er … dragons. You get to mate them and build them houses and feed them. Okay, it doesn’t sound super addicting but, trust me, it is. 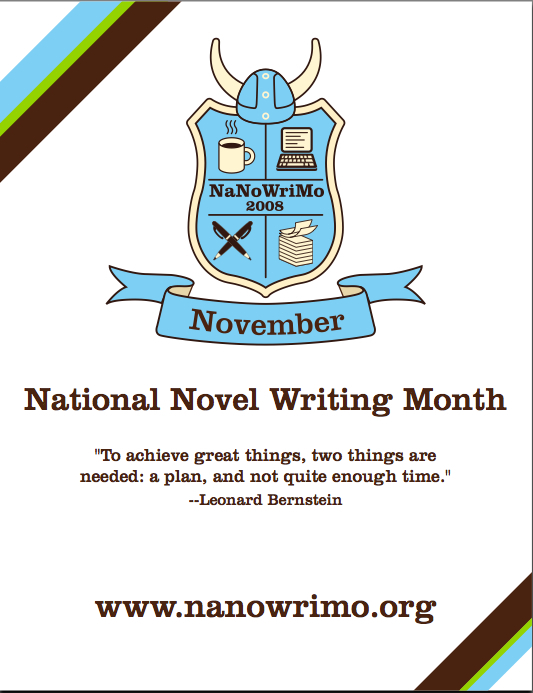 NaNoWriMo: Why write a 50,000 word manuscript in a month? It gets you out of the not-so-creative rut you may be in. 2. It’s just what the doctor ordered. You know that manuscript? The sick one? The one you’ve been meaning to make some chicken soup for, take to ER, and rub its back till it feels better? NaNo gives you a whole month to indulge the headachy, snot-filled, fever-ridden work-in-progress. After 30 days of caregiving, you’ll know beyond the shadow of a doubt whether or not the patient can be saved. 3. It will force you to look at things from a new vantage point. With NaNo, there’s precious little time for second-guessing. Or editing. Or proofreading, for that matter. It’s a write-like-your-life-depends-upon-it undertaking. Which makes you overlook things that may have slowed you down in the past. Every new NaNo day marks uncharted territory. There is no time to revisit what you did yesterday. Get ready to be bumped out of your comfort zone! 4. Try something daring. Has your writing become rote? Complacent? ~ahem~ By-the-book (pardon the pun)? NaNo gives you permission to throw away your crutches and safety nets. Try something you’d never normally do. Go ahead: it won’t kill you! 5. You discover your personal writer’s work ethic. No matter how supportive your cheerleaders, no one can write your book for you. (Technically, that’s not true. Ghostwriters can. But that kind of negates the whole “I’m going to write a novel this month” thing…) NaNo shows you exactly what it takes to shoulder the book-writing load and git ‘r done. Sounds good to me! 🙂 Read the entire post here: Top 5 Reasons You Should Do NaNoWriMo This Year. The original post has wonderful photos; I love the one of the dog trying to eat water.